Abstract. 1. Proppant Selection. Introduction. 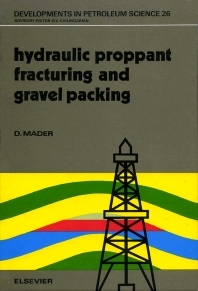 Historical development of hydraulic proppant fracturing. Proppant types and grain sizes. Proppant selection for hydraulic fracturing and gravel packing. Proppant applications. Conclusion and outlook. 2. Marketing and Economics. Introduction. Economical influences on hydraulic proppant fracturing. Stimulation market differences between USA and Europe. Areal marketing assessment of hydraulic proppant fracturing. Concluding assessment of proppant marketing potential. 3. Rotliegend Stimulation in Europe. Introduction. Distribution of main fields. Historical development of production and fracturing. Permeability prediction and effective permeability. Permeability deterioration and clay mineral distribution. Minimum pre-fracturing gas production rate and poroperm properties. Stimulation cost and fracturing policy. Philosophy of offshore and onshore exploration well fracturing. Implications of fracturing philosophy on proppant selection. Horizontal and vertical differences of fracturing potential. Water sensitivity. Other aspects. Sedimentary structures of fluvial, aeolian and lacustrine deposits in Rotliegend and Buntsandstein illustrating distribution of reservoir heterogeneities and natural fractures. 4. Hydraulic Proppant Fracturing. Introduction. Containment of fracture propagation in thin sandstones. Proppant saturation and conductivity improvement. Targets of unconventional gas stimulation. Hydraulic proppant fracturing of carbonate rocks. High-permeability reservoir fracturing. Geothermal fracturing. Minifracturing and other small-scale fracturing. Oil-reservoir fracturing. Communication fracturing. Fracturing of deviated wells. Fracture damage. Aggressive fracturing design. Conclusion. 5. Gravel Packing and Sand Control. Introduction. Gravel types and grain sizes. Gravel packing completion fluids and gravel saturation. Reservoir stability and fluid dynamics. Areal distribution of potential reservoirs. Particle transport through perforations. Steam-drive enhanced oil recovery. Special gravel pack applications. Other sand control methods. Influence of completion type of gravel packing. Formation damage during gravel packing. 6. Propped Fracture and Gravel Pack Monitoring. Introduction. Fracture detection and determination. Gravel pack checking and evaluation. 7. Bibliography. Introduction. Subject key classification. Reference list. Index. Many aspects of hydraulic proppant fracturing have changed since its innovation in 1947. The main significance of this book is its combination of technical and economical aspects to provide an integrated overview of the various applications of proppants in hydraulic fracturing, and gravel in sand control. The monitoring of fractures and gravel packs by well-logging and seismic techniques is also included. The book's extensive coverage of the subject should be of special interest to reservoir geologists and engineers, production engineers and technologists, and well log analysts.